Schools in the Oswego City School District participated in the Child Advocacy Center’s annual Pinwheels for Prevention program. Pictured are students from Leighton Elementary School. 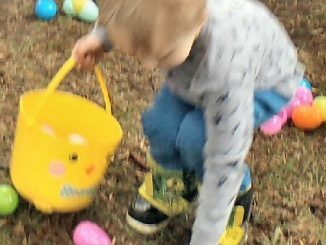 In front from left are: Rachael Crane, Joseph Wall and Aiden Benway. In the back row from left are: Alexander Loayza, Megan Cheeley, Lilly Allison and Isabella Richmond. OSWEGO, NY – In recognition of Child Abuse Prevention Month the Oswego City School District has partnered with the Child Advocacy Center of Oswego County to help raise awareness of child abuse in Oswego. For the third consecutive year home and school associations and student councils have come together to be a part of the CAC’s Pinwheels for Prevention program. An initiative of Prevent Child Abuse America, the focus of the Pinwheels for Prevention program is to not only raise awareness of child abuse but, more importantly, transform that awareness into action. Child Advocacy Center board member Mary Helen Park explained that each participating school had blue and silver pinwheels available on site. For a minimum donation of $1 staff and students may add their name to paper pinwheel that is on display at their school. All donations benefit the CAC and its efforts to combat child abuse in Oswego County. 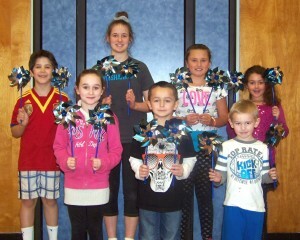 Mylar pinwheels will soon be planted in front of the schools. “We will be planting at least 93 Mylar pinwheels, with each pinwheel representing five children that received services from the CAC,” said Park. The Pinwheels for Prevention program is one of the events kicking off the CAC’s Be The End campaign. The Be The End campaign will officially be announced at the agency’s annual meeting to be held April 23 at 11:30 a.m. at the American Foundry in Oswego. A bold initiative that outlines the necessary steps a community must take to eliminate child abuse in three generations. According to CAC Executive Director Karrie Damm the Be The End Campaign is the first step in the Unto the Third Generation initiative. Damm added that the CAC’s annual meeting and luncheon is open to the public with a suggested donation of $20. For more information on the Child Advocacy Center and to make reservations to attend its annual meeting, register at www.eventbrite.com/BeTheEnd or contact the CAC at 315-59-CHILD. Located at 301 Beech St., Fulton, the CAC is a non-profit organization that works hand-in-hand with local law enforcement, prosecution, child protective services, medical providers, mental health providers, and victim advocacy professionals in Oswego County to protect and serve child victims of sexual and physical abuse. In 2014 the CAC served 465 children and families in Oswego County.